A recording of Stinchcombe bells by a visiting band taken from Youtube. 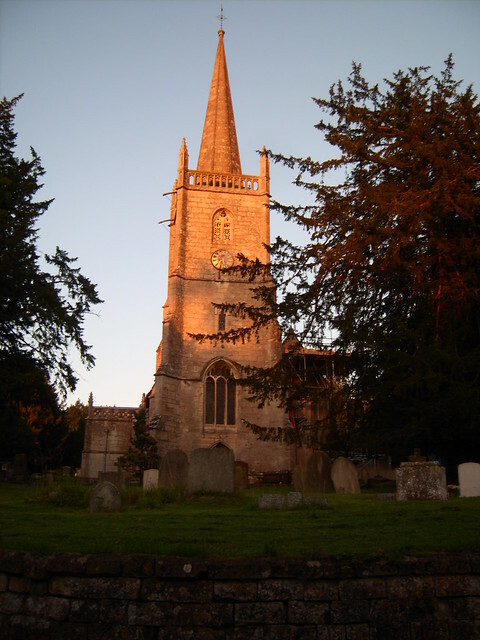 A photograph of Stinchcombe Church. Third above in a fabricated steel frame, remainder in a iron lowside frame on grillage of rolled steel joists. Prior to 1882, there was just one bell, by Abraham Rudhall I dated 1692, with weight approximately 13cwt and 423/4'.Five smaller bells added by Warner to make a ring of six in 1882. This was remodelled into a lighter six in 1971 when the old tenor was recast into a treble and the old third of the six recast a semitone sharper. Some forty years ago Stinchcombe was the focal point for a significant legal battle on a matter of principle; to preserve for future use church bells so that they could be rung full circle in the traditional, English style. The following report is taken from the G & B Annual Report for 1969. In future years 1969 may well become synonymous with 'Stinchcombe', for amidst all the activities of a very busy year the events surrounding the rehanging of Stinchcombe bells have occupied most of our thoughts and time. In 1968 the Association made a grant of £75 from the Belfry Repair Fund towards the rehanging of Stinchcombe bells, and in due course the Whitechapel foundry began the work. When the bells were dismantled the tenor was found to be cracked. Early in 1969 the Association Officers were dismayed to learn that Stinchcombe Parochial Church Council were contemplating hanging the bells dead and installing an electrical chiming apparatus. At the Association Annual Meeting at Tewkesbury a resolution was passed stating the Association should do all in its power to ensure that the bells of Stinchcombe were hung for traditional manual ringing, even to the extent of opposing a faculty. Soon after the AGM the Association Chairman and General Secretary journeyed to North Nibley to meet the Vicar and some members of Stinchcombe PCC, and we were hopeful that as a result of our meeting Stinchcombe would think again. However this was not to be and in July an application to hang the bells dead and chime them electrically was made. When the Association discovered that its objections were not admissible, the Archdeacon of Gloucester offered to present the objection on our behalf. In August the Ringing Master, Chairman and General Secretary again met Stinchcombe PCC, but we were unable to reach any agreement. It was obvious that if the affair was to become the subject of a Consistory Court hearing we would need legal aid, and Mr W B Cartwright, Master of the Worcester Association, agreed to represent us. The Chancellor of the Diocese of Gloucester, the Rev E Garth Moore, heard the case at the Shire Hall, Gloucester in November. After a full day's hearing, in which evidence for the Gloucester and Bristol Association was given by Mr F Sharpe, Convener of the Towers and Belfries Commiltee of the Central Council, and Mr W F Scudamore, the Chancellor deferred his decision sine die, saying that he had in mind a period of four months. He had adjourned the case not because he had not made up his mind, but because he wished to afford the parties with different emphases an opportunity to discuss the various proposals which had been made in court quietly and thoroughly. He asked the Archdeacon of Gloucester to convene a meeting of the interested parties and at the time of writing this report the first meeting has been held. In his judgement the Chancellor emphasised that those outside the parish must bear some of the financial burden. Consequently the Association Officers launched a Special Appeal Fund which it is hoped all ringers in our Association will support. It is our responsibility to see that the bells of Stinchcombe are rehung for ringing in the traditional manner. This is a principle; we must preserve for future generations the heritage which has been handed down to us. The Officers'report for 1969 began with the theme of Stinchcombe and we then expressed the hope that the bells of Stinchcombe would be rehung in the traditional manner. We are happy that 1970 has brought a satisfactory solution to the problem. "Having heard all the parties in open Court on the 19th day of November 1969, and having considered further representations made by the parties IT IS HEREBY ORDERED that an amended petition for a faculty be granted in the following terms:- To rehang the bells in Stinchcombe Church in the Diocese of Gloucester for manual ringing and to recast the cracked (tenor bell as a treble making a lighter ring; also the present third to be recast half a note sharper." A Faculty in these terms was granted on 9th October, 1970. As a part of the agreement with Stinchcombe, the Association offered to remove the old frame and floor from Stinchcombe tower. Under the leadership of the Ringing Master volunteers from the Bristol Rural and Wotton Branches have carried out hard and sometimes dangerous, work over several weekends. Their labours are very much appreciated. At the time of writing it seems that it will not be very long before the bells of Stinchcombe are back in the tower, ringing out once more to the Glory of God. We now know that 1971 will see the bells of Stinchcombe ringing again in their right and proper manner, I think it is only very few of us who know how much lime and energy our Association Officers have given to this cause. It has made us in ihe Wotton Branch realise how thankful the whole Association should be for such loyal and hard working Association Officers. We now look forward to the day when the service of Re-dedication takes place, and then to when Association Officers meet together to attempt the first peal on the bells. Graham G C Minors, Hon. Sec. As noted in part 1 (above) the Consistory Court Hearing which resolved this affair was reported in detail in The Ringing World of Friday 5, 1969, No. 3059 Vol. LXV. It ran to a page and a half and was clearly the lead article in that edition. I am grateful to Martin Kerslake-Griffiths, a former Branch Member and a former editor of Clangour, now residing in Spain, for his memories of the events leading up to the Court Hearing. The bells had been rung irregularly for some years because of a lack of ringers. Recently, they had only been rung by visiting ringers. The architect's quinquennial inspection, December 1967, pronounced the tower and bell frame lo be unsafe. The PCC launched an appeal to raise the money to have the bells rehung - £1000 within a year. Contracts with the bell founders were made and the work begun, then a crack was discovered in one of tlie bells - the additional costs were quoted as : recasting £279, welding £144. These costs included the welding of the tenor bell. A further £135 would have to be added if the bell were to be recast. On a technical point the Chancellor ruled that this was an application for a new faculty. The original faculty was now dead and could not be amended. The vicar reported that the two systems were explained to a well attended public meeting in May and the meeting was almost all in favour of electrical chiming. He went on to say that outside interference had disrupted the appeal and would make it difficult to raise any more money. The PCC had resolved that if the faculty were not granted they would simply return the bells and leave them as they were, unringable. £300 received from other bodies. He agreed with Mr Hutton that bad ringing would crack bells - when later questioned by the G & B representative he was unable lo say what he meant by "bad ringing". Lt.-Col. C. P. Coke, PCC Secretary, said the general opinion in the parish was that electrical chiming should be installed. He went on to say that had he known previously what he knew now, he would not have written to the G & B to request a grant. One other person spoke on behalf of Stinchcombe and when challenged he was unaware that the bells at Leighterton, mentioned in his statement, were tubular bells. He also suggested that Stinchcombe would not be setting a precedent as gramophone records were used at Uley, Sharpness and Kingswood! "With a faculty?" enquired the Chancellor. After a break for lunch, the case for the G & B was presented. Their first witness was Mr Fred Sharpe, past President of the Central Council and Convener of its Towers and Belfry Committee. He began by pointing out that he had inspected bells in no fewer than 2972 churches. He suggested that the cracked tenor, a Rudhall bell of 1692 was not one of the foundry's best and should be recast as a smaller bell to create the treble of a lighter ring - this would save cost. He also said that the other bells could easily be tuned to give a lighter ring with full tone. He proposed a lighter ring with Ellacombe chiming apparatus. He also commented that the full tone of a bell could not be heard unless it was swung full circle. To return to chiming was to go back to the times before the Norman Conquest! The parish was guilty of gross negligence if bells hung in 1882 were now, in 1969, unringable. His own experience of recruiting ringers suggested that this was not a problem, even in villages smaller than Stinchcombe. Welding cracked bells had not been particularly successful. Mr W Scudamore, G &. B Ringing Master next gave evidence. He pointed oul that as an 'affiliated' tower Stinchcombe was entitled to ask for instructors to train a band of ringers, this service would be provided at the Association's expense. G & B:It is unthinkable !o prevent bells from being rung in the traditional, English, manual method. "It is our view that one should hesitate a long time before making a decision lo operate bells electrically. A petition to rehang a ringing peal 'dead' is quite different from a petition to operate a single bell electrically. If the petition were granted it would be a long time before the bells were rung manually." Had the tenor bell not cracked the bells would have been rehung in the traditional way. He thoroughly understood the irritation of those in the parish against outside interference, but he did not attach too much weight to it. The outside world had an interest. As noted in part I he then went on to propose a roundtable discussion to enable the two sides to discuss the way forward. This was to be under the Chairmanship of the Archdeaon. In his other remarks he said, "It may be that Mr Sharpe was right - the whole peal should be re-phased." "We consider the Chancellor's decision was a wise one. We will do everything in our power to co-operate with the PCC". As noted in part 1, the two sides did meet, several times and a mutually agreed plan was eventually put before the Chancellor. The G & B provided a good deal of the labour needed to complete the project and training was provided. The bells were re-modelled as a lighter ring of six in a new frame. The electrical chiming system was installed. A band of ringers was recruited, and trained. Mary Bliss, in her book, The Church Bells of Gloucestershire, writes about the Consistory Court hearing and its outcome. She goes on to report that the principle of preventing a ring of bells from being hung dead was thought lo be of such importance that the Association launched a national appeal among ringers. This was well supported, successful and allowed the Association to fulfil its promises. The dedication by the Lord Bishop of Gloucester took place on 18 August, 1971. A large congregation listened to the bells ring 120 Plain Bob Minor, first as rung by the electrical apparatus and then manually in the traditional manner. This is not quite the end of the story. Later that August evening there was thunderstorm. Lightning again struck the spire; this time there was no harm to the fabric, but the electrical apparatus was pul out of action. It was however, subsequently repaired. The book by Mary Bliss and Frederick Sharpe was an unintended outcome of the affair. The realisation that so little was known about the bells in the towers of the Gloucester Diocese provided the stimulus for Mary Bliss and Frederick Sharpe to research and record the detail of all the bells in all the churches in the Diocese of Gloucester. How much more money had to be raised? Who from the Wotton Branch was involved in the work? Were Dr Sykes and Graham Minors part of the original band? Who were the other ringers? Can anyone around in 1969, remember anything else about the Stinchcombe affair? Can anyone, with access to PCC minutes or parish magazines add anything? Has anyone any photographs of the work in progress? I would be pleased to hear from anyone who could add to the story. The first peal on the bells was rung on 30 November 1971. It contained one member of the new local band (Dr Ian Sykes) ringing his first peal, also Mary Bliss (G & B Chairman) and Fred Scudamore (G & B Ringing Master) who did so much to ensure the bells were hung for full circle ringing again. The others in the band comprised Graham Minors (Branch Ringing Master) and two members of the Bristol Rural Branch who all helped in the rehanging project. The peal was not claimed a "The first peal on the bells", even though it was, but just as "First peal on the newly restored peal of bells." (7 Methods: 6 extents each of Reverse Canterbury, St. Nicholas, Winchendon Place, Plain Bob, St. Simon's, St. Martin's and Grandsire). First peal on the newly-restored peal of bells which were the subject of a Consistory Court Hearing in the Diocese of Gloucester, November 1969.